When we create a method, class or interface, we usually specify the type of the parameter and its return type. This will display 10 in the message box. To solve the problem what we do is write another overloaded function showValue which takes the string as input as shown below. Now both will work fine. In the above example, We have duplicated the code MessageBox.Show(val.ToString()) in both the functions. This works correctly, but it is not efficient. If we want to extend the function to handle double data type, then we need to write one more overloaded function repeating the code again. The solution is to write the code once, which will handle all the types. And that is where generics come into the picture. <T> is just a placeholder for the data type. It is more like a blueprint for the type. T is substituted by the actual type at the runtime. Generic methods can have multiple parameters. Parameters can be of different types. In the example below first parameter, val1 is of a generic type, while second parameter val2 is of type int. 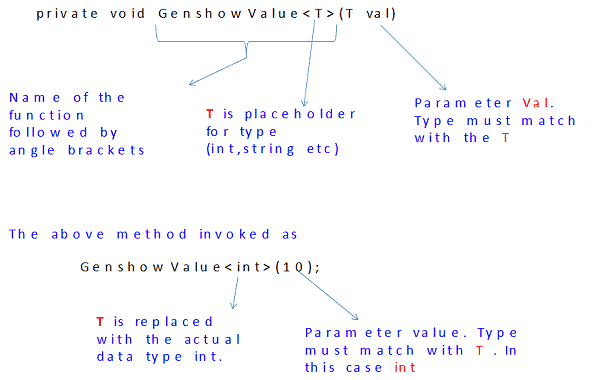 You can have two generic type parameters of the different type as shown below. Like methods, classes can be made to act on generic types. The concept is very much similar to the method. In the example below, we modified the code GenshowValue and moved it into the class. The Interface and delegates can be made to use generic types similar to the class. Allows you to write type-safe code as C# Generics are checked at the compile- time. If you use objects instead of generics, then casting to the correct type needs to be done at runtime. Using objects instead of Generics also has the problem of boxing/unboxing of value types or casting in case of reference types. C# Generic programming allows us the create highly reusable code. Code that can be reused in many different places and situations. Generics allow us to create methods, classes, interfaces, and delegates work with multiple types while still being type safe.